1. Open a .svg file using GIMP. 2. 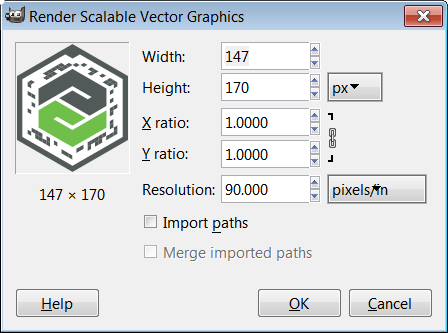 The Render Scalable Vector Graphics window appears. 3. Select the appropriate unit of measurement from the drop-down menu next to the Height field. 4. Enter the desired Width of the ThingMark. To preserve correct proportions, the Height property is adjusted automatically. 5. Set the desired Resolution. Setting the Resolution to 120 pixels/in displays the best with Microsoft-based tools, including Microsoft Office. Other resolutions can result in incorrect printed sizes. You can print directly from GIMP. Alternatively, if you are printing multiple ThingMarks or multiple sizes, you can perform the Select All action (Ctrl+A) and copy/paste the ThingMarks into Microsoft Word. When printing ThingMarks from Microsoft Word or Adobe Acrobat/Reader, ensure that you do not to select printing options such as Shrink to fit. These options could adversely affect the size of the printed ThingMark. You can also export the ThingMarks for later use using the following steps. 1. From GIMP, select File > Export As. 2. Enter a filename in the Name field. 3. Select the desired location path using the Save in folder field. 4. Select PNG image (*.png) as the file format. Saving the ThingMark in other formats, such as a JPEG, can result in the loss of quality due to compression.